The genus Malus comprises a variable number of species, from as few as 25 to well over 50, depending on how hybrids and subspecies and varieties are classified. The species of major economic importance is the domesticated apple (Malus x domestica), but several of the wild species are used as rootstocks, ornamental trees (flowering crabs), and sources of disease resistance for domesticated apple. 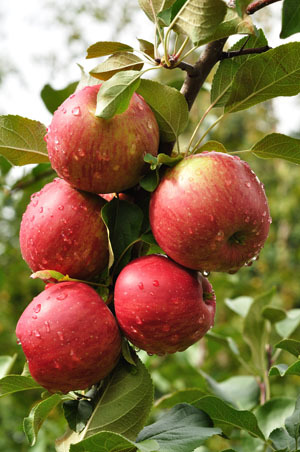 The center of diversity for the Malus genus is in Asia, and many species are native to China. The species range extends to western Europe and parts of both eastern and western North America. Malus species grow as deciduous, woody shrubs and trees in forested areas. Most species are obligate outcrossers, and produce fruits that range from 1 cm to >5 cm in diameter. Species and can be propagated by seed, but are usually grafted to preserve desired genotypes in a cultivated setting. Interspecific hybridization is often successful among species of the same ploidy level, and wide intergeneric hybridization events between domesticated apple and Pyrus communis (European pear) can potentially yield fertile offspring. The majority of the species in the genus are diploid, with a haploid number of n=17. Ploidy levels in the genus range from 2x to 5x, and there are several species that span multiple ploidy levels. Genome size estimates are not available for every species in the genus, but a comprehensive survey of C-values shows that most diploids have a nuclear DNA content within 5% of domesticated apple, which has an estimated genome size of approximately 750 Mb. This indicates that there is not high variation in genome size within a ploidy level. Species with higher ploidy levels have predictably higher DNA content levels, but with a trend towards a decreasing amount of DNA per genome. Available Malus transcript data in GDR . Click on the Transcript Assembly name for more detailed information. The Malus Reference Transcriptome (Malus RefTrans v1.0) from published RNA-Seq and EST data is coming soon.